Kabrousse Surf Camp - Cap Skirring, Casamance Guests overall rating: ★★★★★ 5 based on 2 reviews. The camp is located in the South of Senegal, near the beach and all services. The place is well-known for the happiness and kindness of the people, long white sand beaches and empty waves for all the level. White sand beaches for perfect for learners. Empty point breaks, with endless waves lasting up 1 minute and powerful beach breaks will be a true dream for advanced surfers. You can choose from private bungalows, for two or three people. Each bungalow features a private bathroom with hot water showers, laundry service, cleaning service. bar and restaurant. Enjoy the bar and restaurant with free Wifi, the garden area. There is an area to keep all the surf equipment. A lovely resting zone where you can chill between surf sessions. 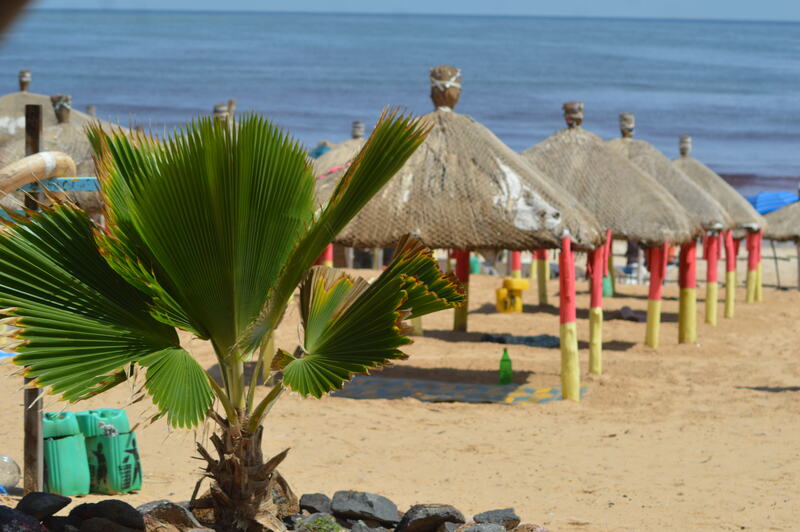 In your free time you can enjoy a wide range of activities, as relax at the beach or explore the famous senegalese culture. 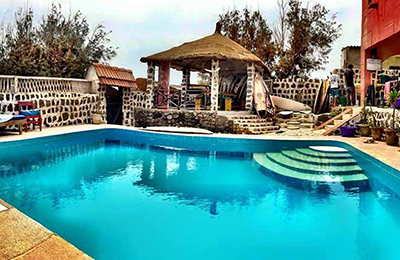 The camp is composed of 4 cozy bungalows, and a lovely green garden just 5 minutes away from the beach. Twin and double bedding arrangements are available. An extra single bed can be added. The guests can enjoy the bar and restaurant with free Wifi, the garden area, an area to keep all the surf equipment. A lovely resting zone where you can chill between surf sessions. You can choose between breakfast only/half board and full board options. A copious breakfast, lunch and dinner are served at the camp restaurant. Your hosts will make sure to address your special dietary requirements if you have any. Please, make sure to inform the hosts in advance. Learn or improve your surfing with the teaching method, which was perfected for 12 years in Spain, and now being brought to South Senegal. A dream place, surrounded by white sand beaches, palm trees and hot water in the middle of the winter. The water temperature ranges from 23 and 26 degrees C between the months of October and May. White sand beaches for perfect for learners. Point breaks, with endless waves lasting up 1 minute and powerful beach breaks for advanced surfers. You will be getting around in camp’s SUV, searching the best conditions for your surfing level. Your guides and teachers will take you to the best spots. There are packages for Boards available for all levels – from learners to pros. Depending on forecast and swells the camp wakes up to catch up the best conditions. The day starts with a copious breakfast before searching for the best waves. After a minimum of two hours in the water, you will go back to the camp to have lunch. You can just relax at the camp or dedicate your afternoon to exploring the village, go net fishing, etc. In After the lunch and some spare time, you go back to the beach for another surf session. You can end the afternoon enjoying the sunset with some drinks in one of the beach bars. Imagine yourself comfortably placing your bare foot in warm white sand, sipping on a soda or a beer and peacefully watching the our star roll over the horizon. You can have some rest in the camp till dinner time and go to rest after a fulfilling day or you can finish the day in the bar with some cheerful music and a few beers. Spend your afternoon visiting the surrounding town, local markets and museums. Go fishing in the sea or from a pirogue in the mangrove. Surround yourself with the famous senegalese culture, with its dances, music, fashion, agriculture and livestock, which all together will memorably enrich your Senegal experience. The facilities are located by a small town of Kabrousse. Nearby you can find some bars, grocery stores, pharmacy and other local businesses.The beach is less than 10 minutes away walking. In Cap Skirring you can find handmade products markets, food market, banks, lots of shops and restaurants, the airport. You can reach Cap Skirring in our vehicle or in one of many taxis continuously coming and going between Kabrousse and Cap for less than 0.30 euros. 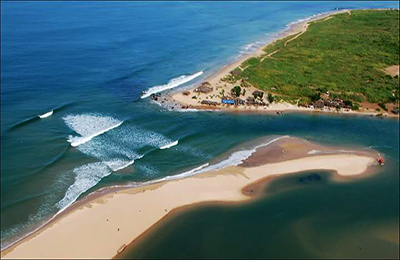 The camp is located in the south of Senegal, in Casamance region, bathed by the Atlantic Ocean, and receiving both swells from north and south. 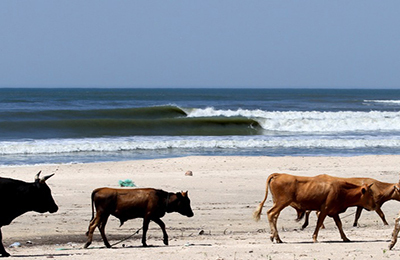 Beachbreaks and points breaks, what gives the area a wide range of possibilities to choose your preferred wave. The camp is located just 2 km from Cap Skirring, a town on the Atlantic Ocean coast of the Basse Casamance (Ziguinchor) region of Senegal. It is a popular seaside resort for Europeans and has an airport – Cap Skirring Domestic Airport. The camp lays in the very south of the country – in 500 km from the Senegal capital – Dakar, but just 200 km from Gambia’s capital – Banjul. Being located very down south of Senegal, the border of neighbour country Guinea – Bissau is just a few km away. Fly to Dakar, then either boat to Ziguinchor or a domestic flight to Ziguinchor or Cap Skirring. It’s only a one-hour car ride from Ziguinchor to Cap Skirring. It is very difficult to flights to Ziguinchor or Cap and boats to Ziguinchor online – the camp hosts might be able to help you with that. Shuttle to Cap Skirring airport is included in the package. It is also possible to take a flight to Banjul (Gambia). Ask the camp hosts for the shuttle from there to Cap Skirring. It’s about 3 hour ride. With this option you have to know there are several police controls in the way. You will have to arrange and pay a visa from Senegal to Gambia. As the regulations between two countries are not quite thought through, it is recommended to cautiously research Gambia-Senegal visa policy before choosing this option. The shuttle to the camp available at additional fee of 35 EUR. The camp offers packages of Surf Lessons, Surf Guiding, Stand Up Paddle. You must indicate the type of activity, when booking a camp. The prices of the packages differ only by your choice of lodging: Breakfast Only, Half Board, Full Board. Accommodation in double or triple room (single room available = + 10€ supplement per night). "Paso algunas temporadas al año en Casamance y visito a menudo la zona de vuestro surfcamp. Os felicito por la iniciativa! Me encantara venir a provar cuando este por alli! Lo reenvio. Buena suerte!" "El sur de Senegal es un territorio virgen para el surfing y Surfcamp nos lo descubre, olas virgenes y solitarias, agua entre 22 y 26 grados y sol todo el invierno, por no hablar de su encantadora gente."